This incompletion to tight end Eric Ebron against the Patriots is among numerous miscues for the Colts so far this season. INDIANAPOLIS — Andrew Luck made his thoughts perfectly clear after another loss last week. He expects the Indianapolis Colts to clean things up. Whether it’s missed throws, dropped passes, penalties or turnovers, just about every glaring flaw that could strike has, and it’s left the Colts in a major early-season bind. “Basically, what he’s talking about is we’ve got to stop making self-inflicted mistakes, the penalties, things that we can control, ball-handling and things like that,” running back Robert Turbin said Monday. Until the Colts start making more plays — and fewer mistakes — the results aren’t likely to change. Indy (1-4) has lost three straight, falling two games behind AFC South co-leaders Jacksonville and Tennessee. And with just a few corrections, things could look very different. Cincinnati snuffed out one comeback chance when usually sure-handed tight end Jack Doyle fumbled in the final minute of the season opener. The Bengals returned the fumble 83 yards for a touchdown to seal a 34-23 victory. Two weeks later, at Philadelphia, Luck again had Indy in position for the go-ahead touchdown with less than two minutes left — only to be sacked on fourth-and-3 from the Eagles’ 4-yard line. In Week 4, at home against Houston, receiver Marcus Johnson failed to haul in a third-down pass on the opening possession of overtime, forcing the Colts to settle for a 44-yard field goal. Luck’s errant throw on fourth-and-4 from his 43-yard line allowed the Texans to drive for the winning field goal as time expired. 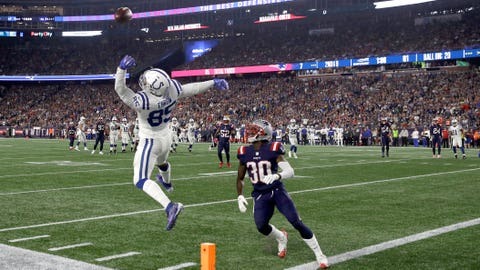 On Thursday, Luck’s strong second half cut a 21-point deficit to seven until Zach Pascal‘s inability to make a catch at the New England 38-yard line led to an interception. The Patriots converted the turnover into a TD and a 38-24 lead. While the receivers’ miscues certainly have been in the spotlight, they are far from Indy’s only problem. Luck’s postgame comments began with a self-critique. Since returning from surgery on his right shoulder, Luck has thrown a league-leading 245 passes with eight touchdowns and five interceptions and blamed himself for misreading a blitz the only time he was sacked Thursday. Only eight teams have committed more penalties than Indy’s 38. It would help if the Colts could get some of their playmakers back on the field. The offense played Thursday without Doyle, Pro Bowl receiver T.Y. Hilton, both of its starting offensive tackles and starting running back Marlon Mack. The defense began the game without rookie Darius Leonard, the NFL’s leading tackler through four weeks, and cornerbacks Kenny Moore II, Quincy Wilson and Nate Hairston. It finished without safety Clayton Geathers (concussion), linebacker Anthony Walker (concussion), defensive tackle Denico Autry (hamstring) and safety Mathias Farley (hamstring). Reich — and everyone else inside the team complex — hopes a few extra days off between the loss to New England and Sunday’s visit to the New York Jets will help get some key players back. Leonard also believes he’ll play this weekend. But the Colts know the actual solution is less about who is on the field and more about just playing smart football. NOTES: The Colts signed defensive end Al-Quadin Muhammad and safety Tray Matthews to the practice squad Monday. Muhammad was originally claimed by the Colts off waivers from New Orleans following the final cutdowns and played in two of Indy’s first four games. Matthews was an undrafted rookie who was cut by Minnesota on Sept. 1. … Indy also re-signed tight end Mo Alie-Cox to the practice squad late last week.